Ghosts, ghouls, candy…and SharePoint? Clearly not the obvious choice. But who says IT folks can’t have a sense of humor? ScarePoint Saturday is the fourth in our series of semi-annual Twin Cities SharePoint Saturday events. This fall’s event is scheduled for October 29, 2011 at Normandale Community College in Bloomington, MN. SharePoint Saturdays are FREE training events designed to provide education and SharePoint-centered networking opportunities. SharePoint Saturday Twin Cities has been growing steadily over the past 2 years, growing from 100 attendees in March 2010 to nearly 300 attendees in April 2011. And while I’m not objective, I think ScarePoint Saturday might just be our best (and largest) event yet! But we’ve also added in some new elements. The SharePoint 101 track will help new SharePoint-ers hit the ground running. From an overview of what SharePoint is and how it can be used to gathering requirements, understanding critical success factors and calculating return on investment (ROI), this track delivers SharePoint success. The new hands-on lab provides an outstanding opportunity to learn from the best. Mindsharp will be on-site with two of their best trainers and a room full of laptops. If you’re interested in creating reusable workflows or using document set content types in SharePoint 2010, you won’t want to miss Tamara Bredemus’ sessions! And if you need a deep-dive on SharePoint’s Application Programming Interface, don’t miss the hands-on deep dive with Todd Bleeker. So who will you see there? We’ve got an amazing speaker pool for this event, including Bill English, Todd Bleeker, Shai Petel, Virgil Carroll, Zandy Garrard and many more. I also want to thank some of our speakers that are traveling long distances to attend our event. Ruven Gotz, Richard Harbridge, Chris Geier and Becky Isserman–THANK YOU! We are honored to have you at the event. So come check out ScarePoint Saturday. We’ll take your tricks, your treats and your SharePoint questions. 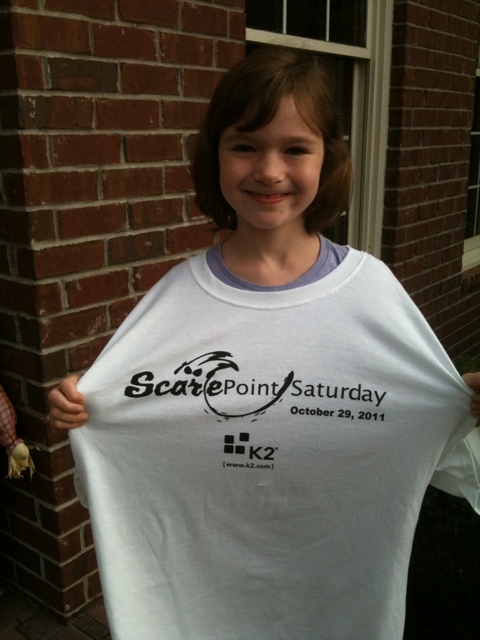 Attendees will also score a limited-edition ScarePoint Saturday t-shirt (model not included).